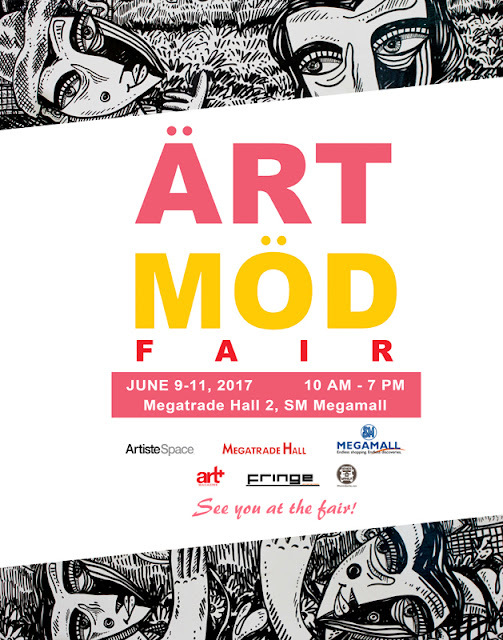 Envisioned to bring the world of Philippine Modern Art to a wider audience, ÄRT MÖD Fair 2017 gathers a host of both established and upcoming visual artists like Philipp Badon, Boysie Villavicencio, Ali Alejandro, Joe Datuin, Toym Imao,Michelline Syjuco, Ronnie Lim, Andy Malluche, Luna Arguelles, Alfred Gallura,Elaine Herbosa, Miguel Buhay, Pilar Quiros, JV Calanoc, Noemi Concepcion, Sky de Leon, Ralph William Villaluz, Emmanuel Mendoza, Allan Sison, Norlie Meimban, Maia Magpantay with the collections of William Borja and Myla Roque andparticipating galleries like Larc En Ciel; Arte Pintura; Transwing; Happy Art; Saturday Group headed by Buds Convocar; FDAP and FEATI University together under one roof. ÄRT MÖD Fair 2017 provides art enthusiasts, students, mall shoppers and thegeneral public a convenient and comfortable venue to experience and appreciate modern art like paintings, prints, photography, sculpture, mixed media and digital art.A rare opportunity for serious collectors and first time buyers alike to find theartwork that match their styles and tastes. Entrance tickets are available at the gate for P100 per person. To get a free 3-day access pass, simply register at http://www.artmodfair.com/art-mod-fair-free-3-daypass/. To find out more about ÄRT MÖD Fair 2017, visit the website at www.artmodfair.com.